The isolation has been done on major compound of Justicia gendarussa Burm.f. (Acanthaceae) leaves, it used as male contraceptive in Papua as ethno medicine. Preclinical study showed activity as a male contraceptive. 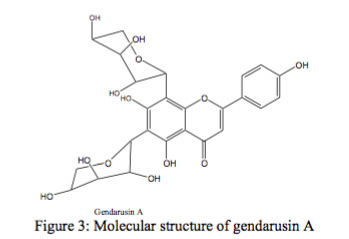 First information, J. gendarussa was known containing flavonoid beside alkaloid, steroid and mineral. 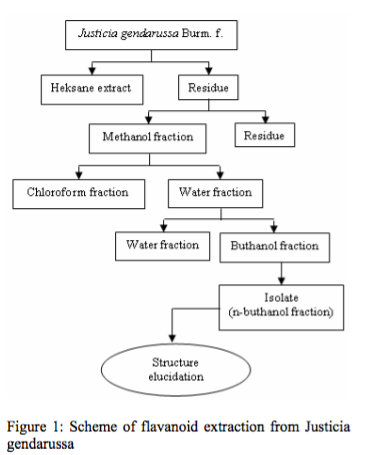 Extraction used by percolation method with n-hexane, methanol, chloroform and n-butanol successively. Isolation and separation were done by column chromatography (silica, diaion and sephadex), MPLC and preparative HPLC. For the analyzing purpose, TLC, LC-UV and LC-MS were used. For the structure elucidation, 1H-13C NMR Inova 500 Mhz was used. Major compounds is 6,8- di-C-α-L-arabinopyranosyl-4’,5,7-trihydroxyflavone or 6,8-di-C-α-L-arabinosyl-apigénine. Minor compounds is 6-C- α-L-arabinopyranosyl-4’,5,7-trihydroxy-8-C-β-D-ylopiranosyl-flavone or 6-C-α-L-arabinosyl-8-C-β-D-xylosyl- apigenine. 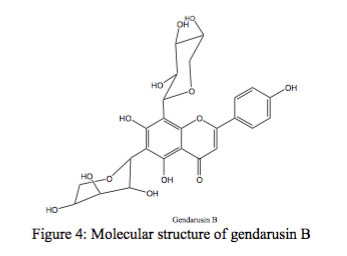 Nevertheless that compounds were not the novel compound, but this is for the first time known in J. gendarussa, so names proposed for both compound were gendarusin A and gendarusin B. From the ethnomedicine study, was known that Justicia gendarussa Burm.f. (acanthaceae) have been used by society of Papua as male contraception (Moeso and Agus 1985). The other names of this plant is Gendarussa vulgaris Nees and Gandarusa as local name,could growth at elevated place 0-500m above the sea. Justicia gendarussa containing Flavonoid, sterol (Prajogo et al. 1997), β-cytosterol, lupeol, friedeline (Chakravarty and Dastidar 1982), iridoid, triterpene, coumarine, alkaloid (Hegnauer 1964), and simple amine aromatic. Antifertility bioactivity study has been done, in the decreased motility and viability of rabbits, mice and men spermatozoa in vitro (Hartati et al. 1997), decreased disperse ability of cumulus oophorus in human in vitro (Sri et al. 1997; Reny et al. 1997) could decreased testosterone concentration in mice serum (Prajogo et al. 1994), Pursue men’s spermatozoa penetration in vitro (Prajogo et al. 1998). LD50 of methanol extract was given orally didn’t influence renal, lever, intestines and histopathology of mice (Prajogo et al. 1998). Beside that, it could decrease Hyaluronidase activity of mice spermatozoa. One of Flavanoid isolation containing Flavonol 3- glycoside (Prajogo et al. 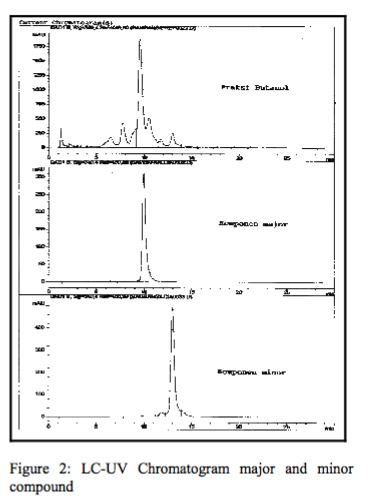 1988) and methanol extract used HPLC method connected with the diode array containing 8 Flavonoid compounds (Prajogo et al. 1997). Continuation research from extraction and isolation result obtain sediment from n-Buthanol (1,2%) and flavanoid total concentration from leaves simplicia 0,18% (Prajogo et al. 2002). The aim of this research was to show which Flavanoid compound in Justicia gendarussa which have antifertility activity in men. Leaves sample was taken from plants which grow at Pacet, Mojokerto. The herbarium was stored in The Departement of Natural Product, Faculty of Pharmacy Airlangga University. Chemical materials used were n- Hexane, n-Buthanol, Methanol, Chloroform, Silica gel GF 254 (Merck), Silice 60 A.C.C (SDS. France), Methanol pro PLC (Merck), and Daion (Mitsubhisi). Instruments used in this study were Rotavapor BUCHI R-114, Rotavapor BUCHI R-153, HPLC-MS TSQ 700 Finigan MAT, HPLC HP 1090, HPLC Analitic Shimadzu LC –10AD, HPLC Preparative Shimadzu SCL-8A, MPLC BUCHI Gradient former B-667, 1H and 13 C_NMR Varian Unity Inova 500 Mhz Extraction used by percolation method from dry leaves powder (4 kg) with n-Hexane, Methanol, Chloroform and n-Buthanol successively (Figure 1). For isolation, the n-Buthanol fraction was separated with HPLC preparative Shimadzu SCL-8A used by Universal LC open column with isocratic system Methanol: Water = 30:70. It also could be obtained from Methanol fraction which has been separated with Diaion open column before, continued with gradient system Methanol: Water MPLC and RP18 as immobile phase. Fist detection from n-Butanol fraction used LC-MS showed 12 flavanoid compounds with retention time from 38 until 50 minute which have same molecule weight (534-535). Purification was held by using HPLC Preparative from n-Butanol obtained one major compound, and then with MPLC from Methanol fraction obtained major and minor compounds. The major and minor compounds were analyzed with 1H-13C-NMR. For the structure elucidation from the data that were obtained such as Chemical Carbon movements, Proton, HBMC, HSQC-TOCSY and the others compared with Flavonoid 1H and 13C-NMR data, 6,8-di-C-α-arabinosyl-apigenin (Prajogo et al. 1998; Prajogo et al. 2002), glycoside 13C_NMR data in C and flavonoid O-glycoside binding (Reny et al. 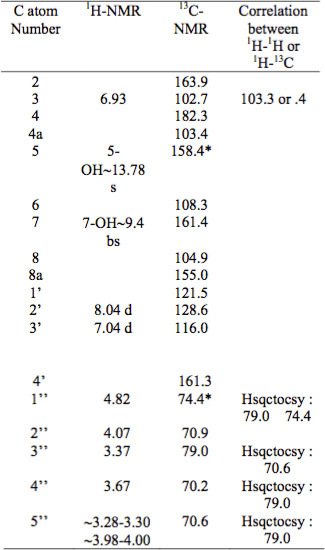 1997), estimate moving chemical structure data used ChemNMR 1H-13C in 5,7,4’ trihidroxy flavone. The results were shown in table 1 and 2. One of the minor compounds in Justicia endarussa Burm. f. was -C-α-L-arabinopyranocyl-4’,5,7- trihidroxy-8-C-β-D-cylopyranocylflavone or 6-C-α-L- arabinocyl-8-C-β-D-ylocilapigenin and names purposed for this compound was gendarusin B. The author was grateful to IRR UNIL Director, Switzerland for the chance to done this research, generous assistance and discussion. Chakravarty, A. K. and Dastidar, P. P. G., 1982. Simple Aromatic Amines From Justicia gendarussa. 13C NMR Spectra of The Bases and Their Analogues. Tetrahedron Vol. 18 No. 12. pp. 1797-1802. Hartati, A., Prajogo EW, B, ., and Onny, P. S., 1997. Effect of Orally Administration of Dichlormethane and Methanol Extract of Gendarussa vulgaris Nees Leaves on Mice Epidydymis Spermatozoa. Symposium of Association of Medicine Natural Product Researcher 9t, Yogyakarta. Hegnauer, 1964. Chemotaxonomie der Pflanzen, Band III, Birkhauser Verlag Basel und Stutgart, p. 41-49. Moeso, S and Agus,P. 1985. Report of The Trip to Jayapura Sentani (Irian Jaya). Faculty of Biology Gadjah Mada University, Yogyakarta, p.19. Prajogo EW, B, . and Suwijoyo P.l., 1988. Isolation of Flavonoid Glycoside of Gandarusa Leaves (Justicia gendarussa Burm.f. ), Symposium of Plant Medicine 6th, Jakarta. Prajogo EW, B, ., Emmy, K., Suhartono, Imam, R., Noor, I., and IGP Santa, 1994. Bioactivity Study on Decoction and Extracts of Justicia gendarussa Burm.f. ASOMPS VIII. UNESCO, Melaka, Malaysia. Components in Justicia gendarussa Burm.f. Symposium of Association of Medicine Natural Product Researcher 9t, Yogyakarta. Prajogo EW, B, Hery A. H., and Aucky, H., 1998. Inhibitory Effect of Effect of Dichlormethane and Methanol Fraction of Justicia gendarussa Burm.f. Leaves on Mice Hyaluronidase Enzyme. Department of Research Airlangga University. Prajogo EW, B, Widjiati and Epy, M. L., 1999. Study Toxicity of Gendarussa vulgaris Nees Leaves on Male Mice Blood Profile and Histopathology of Liver, Kidney, and Intestine. Department of Research Airlangga University. Reny, W., Prajogo EW, B, ., and Aucky, H., 1997. Effect of Dichlormethane and Methanol Extract of Gendarussa vulgaris Nees Leaves on Human Spermatozoa Motility and Viability in vitro. Symposium of Association of Medicine Natural Product Researcher 9t, Yogyakarta. Sri, L., Prajogo EW, B, ., and Aucky, H., 1997. Effect of Dichlormethane and Methanol Extract of Gendarussa vulgaris Nees Leaves on Spermatozoa Activity of Hyaluronidase Enzyme on Human Ovum Cumulus Oophorus in vitro. Symposium of Association of Medicine Natural Product Researcher 9t, Yogyakarta.